For many of us, a shower base is a mere accessory of the bathroom, one that we rarely take regard of during our day to day lives. Even while showering, our attention tends to be directed towards the shower faucet, not the shower base. That does not mean, though, that the base is not an important part of the shower. In fact, the quality and features of your shower base can affect your entire showering experience. Its composition determines how prone it is to cracking. The likelihood of mildew forming on it depends upon the material it is made of. Also, the risk of you slipping in the shower relies entirely on how adhesive your shower base is. So, next time you are shopping for a shower enclosure, you may want to consider carefully the shower base that comes with it. After all, it is the very thing you stand upon while showering. To make your job a little easier, here’s some shower bases we are sure you’ll enjoy. An international brand and global supplier, DreamLine’s products have time and time again proven to excel in standard. This is why we trust that you’ll be impressed by our first item on our list. The single threshold shower base is, as the name suggests, modelled specifically for 3-walled alcoves. It comes in a standard white colour, though that doesn’t mean its overall design doesn’t carry a stylish appeal. 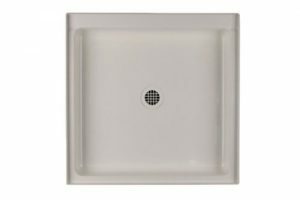 The drain opening of the rectangular shower base is placed to the right and is built for 2 inch compression-fitted drains. When it comes to quality, the item does not compromise. The main component of the shower base is acrylic, accompanied by a layer of ABS. Not only does this prevent flexing of the shower base, it eliminates the need to lay down mortar as support. This also makes the shower base stain resistant and difficult to scratch. If that isn’t enough to impress you, then perhaps it is worth mentioning that another constituent of the shower base is fiberglass, a nifty material that promotes durability. Oh, and don’t worry about slipping. The textured floor design of the shower base reduces the chances of that ever happening. Our next item comes from Swanstone and, with a 32 inch by 32 inch dimension, is made for relatively smaller bathrooms with smaller alcoves. 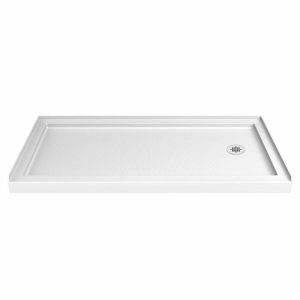 The sturdy build of the shower base is attributed to its main constituent, Veritek. This not only maintains the solidity of the shower base, but also removes the need for any additional layer of coating that could potentially crack or chip. Another great feature of the shower base is that its bottom is specifically designed to avoid the risk of slipping and of potential injuries. 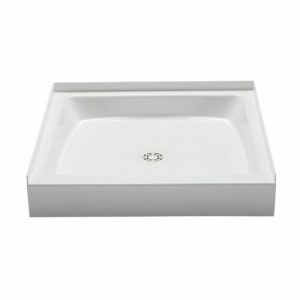 In terms of looks, the Swanstone shower base comes with a bone coloured finish that can be used to set a neutral tone in a bathroom that could otherwise be too colourful or vibrant. Lastly, the shower base consists of an integral tile flange, something that you should most definitely know if you wish to install one in your shower alcove. There’s a lot to talk about when it comes to this shower base in particular, all because of the several impressive features it comes with. Let’s start off with the material. The shower base is composed of polyurethane which makes it long lasting and resistant to scratches and being chips. The inclusion of an epoxy adhesive makes it all the more better as it reinforces the items durability. As the shower base is presented as one piece, leakage is not a worry at all. In fact, the idea of water escaping the shower base is unimaginable thanks to its integrated curb and splash walls. 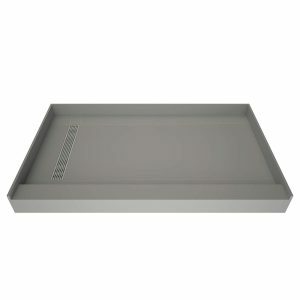 Other features of the shower base include its 2 inch, left linear drain composed of polyvinyl chloride (PVC), its stylish grate with a polished chrome finish, and its inclusion of a tile placed upon the surface of the shower base. And to cap off all of these great features, is the easy and fast installation of the shower base. While some may consider Bestbath to not be the best, it certainly provides some great bathroom accessories. The next item on our list, a walk-in shower base brought to us by Bestbath is testament to that. The main component of the shower base is fibreglass which is accompanied by a finish of high-quality gelcoat. As such, it’s durable, unlikely to suffer from scratches or marks, and is resistant to stains or blemishes. The overall piece is supported by a wood-core, which erases any need to lay down a mortar. It’s also waterproof thanks to its integrated tile flange and the fact that it was built as one piece. It’s also important to note that the shower base is square in shape and is designed for 3-walled alcoves. Best of all, the Bestbath step-in shower base’s flange is specifically built to make the task of installation easy and convenient for owners. 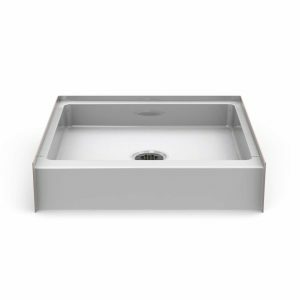 ProFlo is another international brand that supplies top of the line bathroom accessories, and it makes no exceptions for the last item on our list. Delving into the specifications, the shower base is built to serve as a one-piece, freestanding unit. It is quite heavy, weighing in at 29 pounds, but that isn’t for no reason. The shower base is made out of durable composite material that makes it sturdy and hard-wearing. The surface of the shower base is non-porous. What does this mean? It means that the shower base is not only easy to clean, but is thermal and shock resistant. Quite impressive, to say the least. It is also slip-resistant. 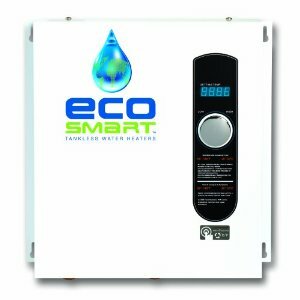 If you’re looking into buying one, then do not worry about installation. The shower base’s drain comes with a compression gasket and strainer to make the entire job much easier.